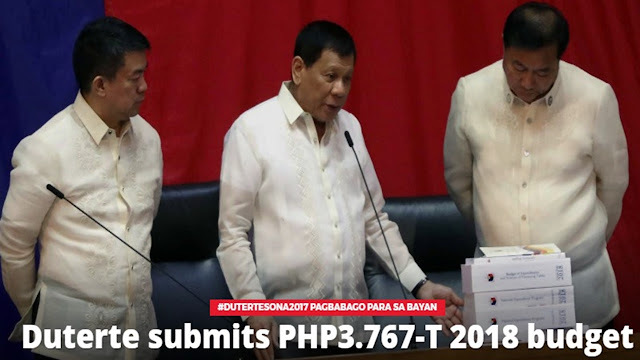 President Rodrigo Duterte formally handed over to Congress the proposed PHP3.767 trillion national budget for 2018 after delivering his second State of the Nation Address (SONA) on Monday. The biggest chunk of the 2018 budget will be apportioned to education and infrastructure development. The PHP691-billion allocation will be used to construct 47,000 classrooms, repair and rehabilitate 18,000 classrooms, procure 84,781 school seats, and create 81,100 teaching positions. Meanwhile, the massive infrastructure program of the Duterte administration, or the “Build, Build, Build”, will receive a PHP1.097-trillion allocation. The administration’s anti-drug campaign will also be strengthened with a higher allocation for law enforcement budget at PHP131.5 billion for 2018, 17.6 percent higher than the 2017 allocation of PHP111.8 billion. The huge increase in the 2018 budget can be financed through “fiscal expansions” that include reforms on existing tax laws such as the proposed Tax Reform Acceleration and Inclusion Act (TRAIN). The comprehensive tax reform package could shore up government revenues with the removal of several Value Added Tax (VAT) exemptions on certain products and services, thus raising PHP81 billion. An additional PHP47 billion can also be earned from the PHP10-per liter tax on sugar-sweetened beverages and another PHP87.8 billion from the excise taxes for petroleum products and automobiles.